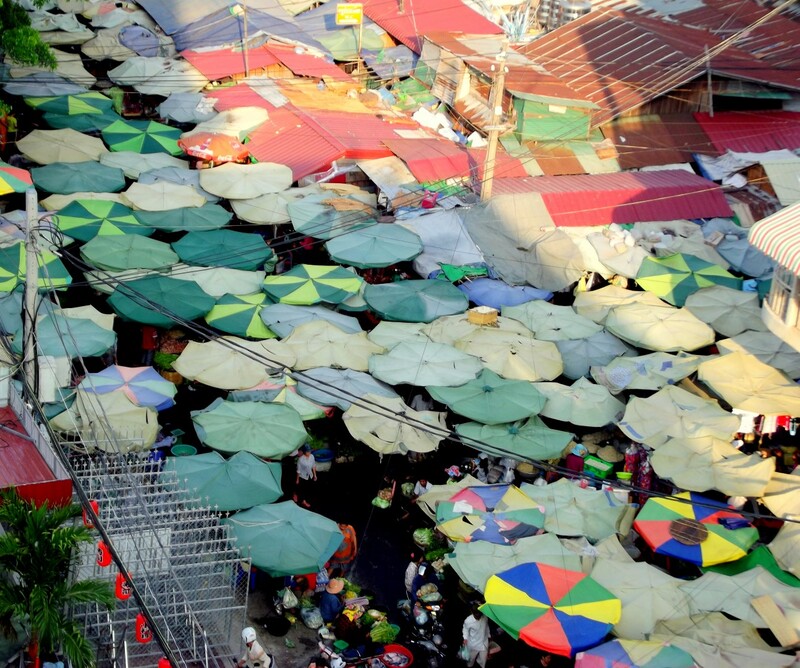 Ancient umbrellas grow like mushrooms in the crowded markets in the Cambodian capital. It is easy to see crowded places as a mass of humanity, the individual personalities lost in the throng or forgotten in the mad rush to survive. And yet so often you get a sudden shock when a hidden gem of a person turns your perception of the world around. I visited a home for elderly people who were too crippled to care for themselves or had no one else to look after them. There was also one young man who had no family and was afflicted with muscular dystrophy. While he was perfectly fine mentally he could not speak and could only gesture. We had brought some personal items like soap, toothpaste and toothbrushes for the residents. The elderly people were much more adept at getting what they wanted from visitors and soon the supplies were gone. The young man did not get anything. I wanted to do something for him, particularly as he did not make a fuss or squabble with anyone and kept his smile. Not speaking Vietnamese I tried to get him to let me know what he wanted. He made motions indicating he wanted a toothbrush. I left the compound and went just down the street to a little general shop, bought a toothbrush and toothpaste and took it back. It cost me practically nothing but he seemed delighted. I wanted to offer him more as I felt terrible that I was able, for practically no effort, to give him something he really wanted and could never afford. He indicated that he wanted a drink and I worked out he wanted me to buy a coffee. Again I stepped down the street, bought a coffee at a little coffee shop and took it back. I was worried that his condition might make it hard for him to drink the hot coffee so I tried to help him with it but he pushed it away and started pointing. He didn’t want the coffee for himself, he wanted me to buy it for an old man in a wheel chair who was missing a leg and obviously loved coffee. Here was a young person, trapped by life’s circumstances in a crippled body, forced to live with people three or four times his age, in the most primitive conditions and not permitted to even walk down the street and I turned up and would happily have bought him anything he wanted…and yet all he asked for was a toothbrush and toothpaste and then thought about his friend. I felt so humbled by this experience and so touched by the obvious generosity of spirit that this wonderful person had within him, despite all of his trouble. I will never forget this glimpse at a truly kind soul and the delight he showed when he saw the old man enjoying his coffee. The photo is also part of the Mundane Monday Challenge which asks you to look for beauty in mundane objects. Beautiful haiku and such a moving story. If I could be but a fraction as good as that young person I would be happy. It was one of those moments in life you never forget. I must confess that although I am a big bronzed Aussie bloke I cried afterwards. TJ, I’m having some trouble with the blog’s organization now.. Am always looking for the most recent challenge but – when I click “TJ’s Household Haiku Challenge” in the upper right hand corner, bottlebrush continues to come up, from 2016. A lovely story about generosity of spirit…his and yours. Beautiful photograph and haiku. A great photo of all of those umbrellas and the haiku was perfect! Such a heartwarming story too that brought a lump to my throat. What a selfless young man. It was strange thing to see from the roof of a modern hotel. Cambodia is a place of huge contrasts. That young man’s ability to be happy in such dire circumstances was heartwarming and heartbreaking all at once. Yes, that certainly came across. Very touching story about a gem of a moment in your life. You are lucky to have met him and to have had the opportunity to show a small kindness that was huge for him. Wonderful haiku and photos to accompany your very moving story. Thank you for sharing it! It’s really something to see how kindness and compassion can prevail even in such difficult circumstances and shine a light on the goodness of humanity and what’s really important. You showed kindness and compassion, too. It can be all too easy to look the other way out of discomfort or fear. Oh MY, TJ–this is absolutely beautiful, so uplifting–and amazing, amidst all the stories of how horrid people are to one another. WOW. I’m all puddly-eyed now. It is still so vivid to me, seeing this fine person caught by circumstances in what an outsider would think was a sad existence making the most of his circumstances. It was truly moving. As you say, we only seem to hear of the evil people do and yet there are definitely beautiful souls amongst us. I imagine it will stay with you quite awhile–thanks so much for sharing something that lifts us up! Thanks as always for your lovely comments. I so appreciate them. The mushroom umbrella view is cool. Nice perspective. And the story is very touching. Thanks so much for your comments. It was a very moving experience. a beautiful story! and great gem/precious stone imagery in your haiku! Bravo! Beautiful post! You’re a triple threat this week. 😉 Great haiku, story and pictures!